JOSEPH KABILA KABANGE, President of the Democratic Republic of the Congo, first providing a snapshot of the security situation in his country over the past year, noted significant improvements in the central region and successful efforts in the north-east in containing terrorist attacks. Peace has been consolidated, with displaced families returning to their homes, yet security challenges remain only in the north-east region in the face of terrorist activities, a threat affecting other countries in the region and across the world. While addressing that threat and boosting security ahead of the forthcoming elections, he elaborated on recent progress on the political landscape. Commending efforts to reach a consensus on the election process and the publication of an electoral calendar, he reaffirmed the irreversible decision to hold elections before the end of 2018 despite enormous challenges in many areas. Moreover, all steps are being taken to guarantee peaceful, credible elections based on the country’s vision of consolidating the political and economic stability needed for further progress. Turning to the session’s theme, he called on each Member State to assess its contribution to the universal whole and to protect the values upon which the United Nations is based. Given emerging development “hubs” and looming threats, some with global consequences, the Organization must adapt to rise to those challenges. Equally important is preserving the foundations of a global balance. Concerned that some States act in contravention with the Organization’s principles, he said the Democratic Republic of the Congo condemned any attempts at interfering in its forthcoming elections. Voicing support for a return to the foundations of democracy and human rights, he said his country is proud to share its experience as a nation, having joined both regional and international forums. 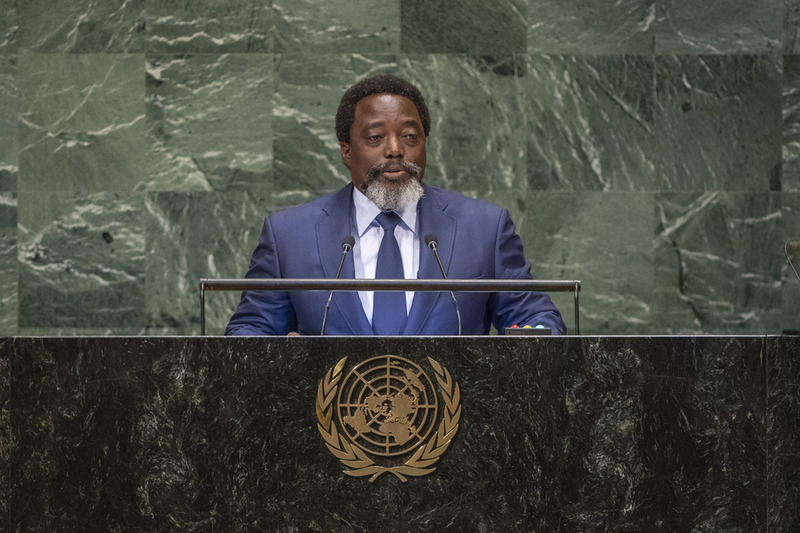 While the Democratic Republic of the Congo has a long road ahead, he emphasized that the United Nations can foster the growth of sustainable societies, which in turn depends on galvanizing the necessary will and honouring promises often made, but rarely kept. Sharing a regional concern, he highlighted that African States had been, for 15 years, calling for better representation on the Security Council. Africa wants its voice to be heard in terms of the maintenance of peace and security, he said, underlining that the call is particularly urgent since most United Nations peacekeeping operations take place on the continent. Regarding the peacekeeping operation currently operating in the Democratic Republic of the Congo, he reiterated a call for the withdrawal of the multilateral force. The Democratic Republic of the Congo had, years ago, been relegated as a “failed State”, he said, adding that his country has overcome many obstacles on the path to peace. While the challenges ahead are great, his country will work hard to continue on that path and will stand by the United Nations. However, Member States must work for a stronger Organization, which represents the preservation of humanity.